New York, NY | February 8, 2018—Madison Square Park Conservancy announces its thirty-sixth exhibition, Delirious Matter by artist Diana Al-Hadid. Six new sculptures are installed across Madison Square Park’s central Oval Lawn, peripheral lawns, and northern reflecting pool. Delirious Matter is the artist’s first major public art project. Artist Diana Al-Hadid (American, b. Aleppo, Syria 1981, lives and works in Brooklyn) has created newly commissioned sculptures in Madison Square Park featuring female figures, some in repose, others restless with agency. Two wall works are combined with rows of hedges to form a room suggesting the elegiac beauty of deteriorating structures nestled into plant material. Three reclining female figures, titled Synonym, sit on plinths and are displayed on the surrounding lawns. In the Park’s reflecting pool, the artist has realized a site-specific sculpture of a female figure perched atop a fragmented mountain. Al-Hadid is best known for creating work using traditional and contemporary sculpture materials and processes in unfamiliar ways that pivot amongst architecture, figuration, and abstraction. Despite the eroded appearance, the process is additive. Al-Hadid devised a distinctive process that is, in her words, “a blend between fresco and tapestry.” Delirious Matter is the first major public art project by the artist. Her work is indebted to storytelling and to a close study of Modernist principles. Female forms are perceptible in Al-Hadid’s walls on the Oval Lawn. The walls measure thirty-six feet long by fourteen feet high and twenty-two feet long by fourteen feet high. Their porous structures enable the viewer to see through the sculpture, to breach the wall. The imagery of these delicate facades stands in contrast to the strapping canyon of early twentieth-century skyscrapers surrounding Madison Square Park. The apparent fragility of Al-Hadid’s materials—a delicately poured polymer modified gypsum and fiberglass—is belied by its toughness and resilience. This inherent tension functions as an essential aspect of the project. One of the artist's walls depicts Gradiva, a reference to the twentieth-century mythological female character from a 1903 novella by Wilhelm Jensen. Gradiva’s name was likely taken from Mars Gradivus, the Roman god who walked into battle. The protagonist of the novella, an archeologist fascinated with the Gradiva bas relief sculpture, obsessively chases his imagined apparition through the ruins of Pompeii on a journey that culminates when Gradiva manifests into his childhood infatuation. With subtlety, viewers will discern Gradiva emanating from the voids in Al-Hadid’s sculptural composition. The second wall, The Grotto, and the sculpture in the Park’s reflecting pool, Citadel, are inspired by a painting called Allegory of Chastity (1475) by Hans Memling, of a female figure protruding from a mountaintop, the rocky formation suggesting an overgrown skirt around her waist. The painting relates to an abundant history of Early Netherlandish paintings depicting voluminous skirts so mountainous that women’s bodies entirely disappear beneath the folds. In all of Al-Hadid’s work, expected confines between figure and landscape, architecture and site, interior and exterior, painting and sculpture, movement and stasis, are obscured. This confusion of boundaries is an integral part of her work. 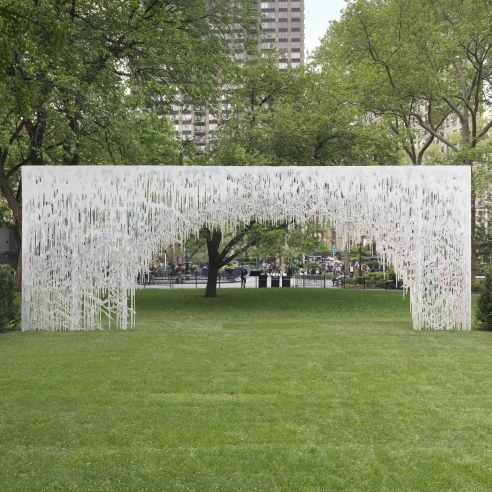 Delirious Matter is the thirty-sixth outdoor exhibition organized by Madison Square Park Conservancy. The project is organized by Brooke Kamin Rapaport, Deputy Director and Martin Friedman Senior Curator of Mad. Sq. Art, Julia Friedman, Senior Curatorial Manager, and Tom Reidy, Senior Project Manager. 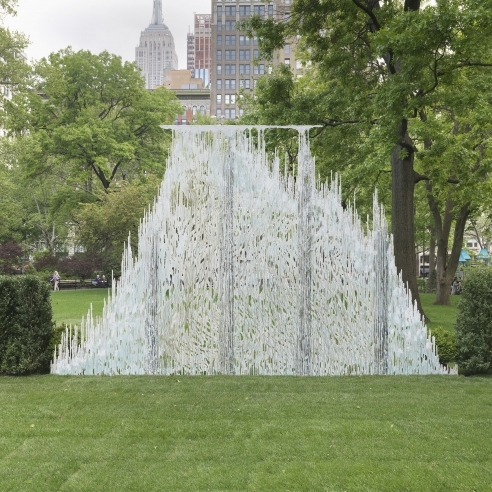 Simultaneous to Delirious Matter’s display in Madison Square Park, the Bronx Museum of the Arts has organized Diana Al Hadid: Delirious Matter, an exhibition of Al-Hadid’s work. Delirious Matter will be on view in the Bronx from May 23–October 14, 2018. Diana Al-Hadid received a BFA in Sculpture and a BA in Art History from Kent State University (2003), and an MFA in Sculpture from Virginia Commonwealth University (2005). Al-Hadid studied at the Skowhegan School of Painting and Sculpture (2007). She has had solo exhibitions at institutions including Hammer Museum, Los Angeles (2010); Nasher Sculpture Center, Dallas (2011); SCAD Museum of Art, Savannah, Georgia (2013); Weatherspoon Art Museum, Greensboro, North Carolina (2013); Akron Museum of Art, Ohio (2013); Secession, Vienna (2014); NYU Abu Dhabi Art Gallery, United Arab Emirates (2016); and Brown University, Providence, Rhode Island (2016). Group exhibitions include The Bronx Museum of the Arts, New York (2006); Weatherspoon Art Museum, Greensboro, North Carolina (2010); The FLAG Art Foundation, New York (2011); Massachusetts Museum of Contemporary Art, North Adams, Massachusetts (2012); Frederik Meijer Gardens and Sculpture Park, Grand Rapids, Michigan (2012); The Farjam Foundation, Dubai (2014); Pizzuti Collection, Columbus, Ohio (2015); deCordova Museum and Sculpture Park, Lincoln, Massachusetts (2015); and Culture City East of Asia, Tokyo (2016). Al-Hadid has been a United States Artists Rockefeller Fellow (2009) and a New York Foundation for the Arts Fellow in Sculpture (2009). She has received awards including a Pollock-Krasner Foundation Grant (2007) and a Louis Comfort Tiffany Grant (2009). Her work is included in public collections including deCordova Museum and Sculpture Park, Lincoln, Massachusetts; The Museum of Fine Arts, Houston; Weatherspoon Art Museum, The University of North Carolina at Greensboro; Whitney Museum of American Art, New York; and Virginia Museum of Fine Arts, Richmond, Virginia. Al-Hadid lives and works in Brooklyn. Madison Square Park’s 6.2-acre site welcomes more than 60,000 daily visitors—a richly diverse audience including local residents, families, public school groups and day camps, office workers, students, artists, and international visitors. Showman Fabricators in Bayonne, NJ worked with the artist and the Conservancy to fabricate Delirious Matter. A celebrated series of sculpture exhibitions by living artists, Mad. Sq. 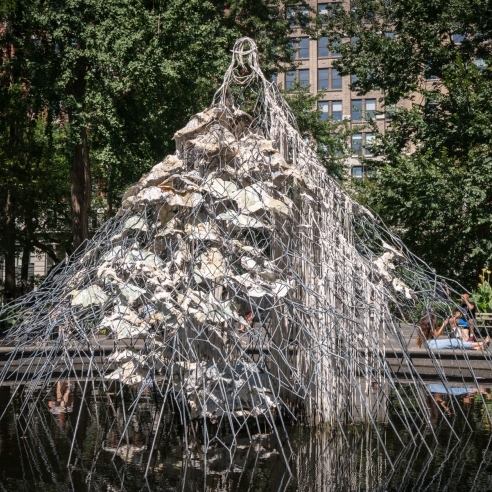 Art was launched by Madison Square Park Conservancy in 2004 to bring free public art programs to New York. The program has received extensive critical and public attention since its inception and has developed into a world-class cultural institution. Its ambition and scale expands each year alongside an increasingly diverse range of innovative, world-class artists. Join the conversation on Twitter and Instagram via the hashtags #MadSqArt, #DianaAlHadid, and #MadSqDeliriousMatter. For more information on Madison Square Park Conservancy and its programs, please visit http://madisonsquarepark.org. Join in lively discussions with artists and thinkers about Delirious Matter and public art. A small mobile library curated by the Uni Project, with books about architecture, art history, and ancient literature, will spring up next to Al-Hadid’s sculptures. Listen for moments of musical accompaniment by solo performers. Explore Delirious Matter up close with members of the Mad. Sq. Art staff. City Lore presents “What We Bring: Stories of Migration,” a performance piece that tells the true migration stories of a group of artists and teaching artists whose stories are symbolized by a precious object they or their family brought with them. Their narratives are interwoven with live music and dance. A dance of gesture and image designed to conjure moonlight. The cast features extraordinary dancer and Sufi teacher Felicia Norton, with music by Peter Garland and choreography and costumes by Alice Farley. Mad. Sq. artist Diana Al-Hadid will host a paper plate creation station. As a youngster, Al-Hadid would construct Halloween costumes from paper plates with her mother. This experience was one of the first material experiments from which she learned. All are invited to join the artist in creating your own costumes and pieces of clothing, as well as contributing to a large collaborative effort made from paper plates. Lialina & Dragan Espenschied, Charles Long, Rafael Lozano-Hemmer, Iván Navarro, Josiah McElheny, Jacco Olivier, Roxy Paine, Giuseppe Penone, Jaume Plensa, Shannon Plumb, Martin Puryear, Erwin Redl, Ursula von Rydingsvard, Alison Saar, Jessica Stockholder, Leo Villareal, and William Wegman. Madison Square Park Conservancy is the not-for-profit organization whose mission is to protect, nurture, and enhance Madison Square Park, a dynamic seven-acre public green space, creating an environment that fosters moments of inspiration. The Conservancy is committed to engaging the community through its beautiful gardens, inviting amenities, and world-class programming. Madison Square Park Conservancy is licensed by the New York City Department of Parks and Recreation to manage Madison Square Park and is responsible for raising 100% of the funds necessary to operate the Park, including the brilliant horticulture, park maintenance, sanitation, security, and free cultural programs for Park visitors of all ages. Delirious Matter is supported in part by an award from the National Endowment for the Arts. Substantial exhibition support for Delirious Matter is provided by Marianne Boesky Gallery, Stacey Goergen, and Showman Fabricators. Major support for Mad. Sq. Art is provided by Charina Endowment Fund, Toby Devan Lewis, Pentagram Design, Ronald A. Pizzuti, Sorgente Group of America, Thornton Tomasetti, Tiffany & Co., and Anonymous. Substantial support is provided by George W. Ahl III, Helen Frankenthaler Foundation, Irving Harris Foundation, The Jacques and Natasha Gelman Foundation, Lenore G. Tawney Foundation, The New York EDITION, Mad. Sq. Art Council, Danny and Audrey Meyer, The Rudin Family, and The Sol LeWitt Fund for Artist Work. Ace Hotel New York is the Official Hotel Partner of Madison Square Park Conservancy. Mad. Sq. Art is made possible in part by the New York State Council on the Arts with the support of Governor Andrew Cuomo and the New York State Legislature. Mad. Sq. Art is supported in part with public funds from the New York City Department of Cultural Affairs, in partnership with the City Council. Madison Square Park Conservancy is a public/private partnership with the New York City Department of Parks & Recreation.